LAS VEGAS (AP) — Police body camera videos released Wednesday show the chaos and confusion Las Vegas police officers and first responders faced at a mass shooting on the Las Vegas Strip as waves of wounded and fleeing concert-goers sought help. One 30-minute video shows an officer inside the venue as hundreds of people are fleeing and volleys of gunfire can be heard overhead. A dozen people are piled against each other seeking shelter behind a tall sign. The officer joins them, hiding behind the sign until there’s a break in the shooting and he and another officer yell for the group to start running. “I have a girl that’s shot in the neck,” someone said as the gunfire starts up again. 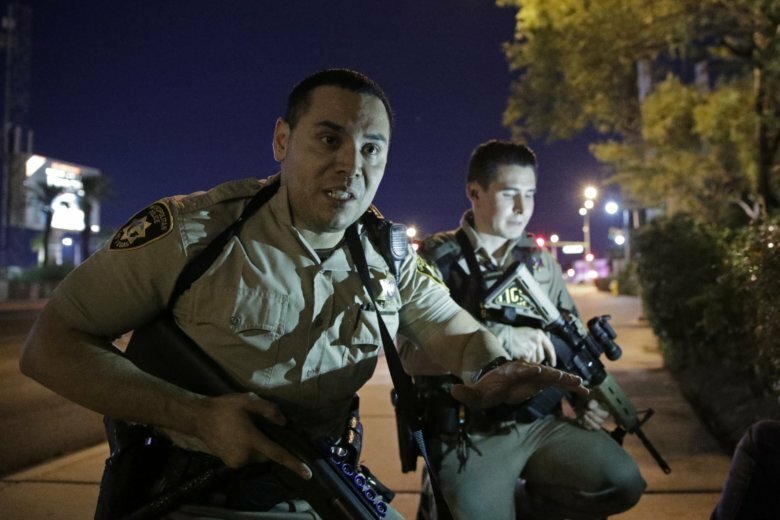 The Las Vegas Metropolitan Police Department released 23 videos and 130 audio files, including 911 calls, on Wednesday without comment. The FBI in Las Vegas also declined to comment. It’s the department’s seventh batch of public records selected for release regarding the Oct. 1, 2017, mass shooting that left 58 people dead. They are being released under a court order in a lawsuit from several media organizations, including The Associated Press. At one point during the 30-minute video inside the venue, the officer and others are running for cover in a large tent past people still crouching or laying on the ground. The officer and someone else yell for people to run toward them and out the back to safety. The gunfire gets louder and appears to be right overhead as people inside scream and hit the floor. One woman appears to be shot and the officer helps carry her out. Video from another officer who was near the site of the country music festival shows pickup trucks coming by with the wounded and others piled in the bed in the back. The officer directs the trucks to trauma centers and then takes more injured people to the hospital in the back of his own police cruiser. One video shows an officer pulling up and getting out of her SUV near an ambulance as a group of people are walking nearby talking on cellphones and looking around, appearing to be in a daze. “Ma’am? Where do we go?” one woman asks the officer. “Just keeping going. Just keeping going,” she replies as the woman starts running. A pickup truck drives by, filled inside and in the back with people. “We’ve got gunshot wounds here,” someone says as the officer and a man nearby help lift a woman out of the back of the truck. Clark County Sheriff Joe Lombardo has said the investigation hasn’t identified a motive for the shooting that also injured more than 800. The gunman, Stephen Paddock, killed himself before police reached him inside a high-rise casino-hotel room. Authorities say Paddock acted alone, and no link has been found to international terrorism. Police lawyers are appealing to the state Supreme Court a Las Vegas judge’s order for documents to be made public. The state high court in April rejected a bid by police to delay the release of records, including officer body camera videos, 911 recordings, evidence logs and written interview reports.